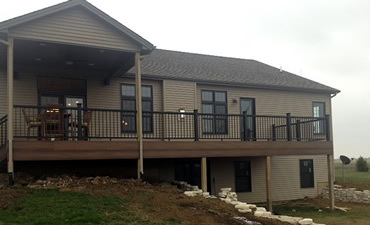 Ruestman Construction specializes in remodels along with decks and construction of new homes. Ruestman Construction enjoys the design and remodel process of bathrooms, basements, garages and kitchens. Using only the highest quality materials and utilizing timeless design trends your remodel process is sure to impress. Whether you need some new light fixtures, storage, bathroom fixtures or an entire home remodel down to the studs, Ruestman Construction can handle it. For homeowners looking to increase their homes value, experts advise that Kitchen and Bath remodels are the most important and should be done first. Kitchen remodels can be a very hard project for anyone wanting to "diy". Most decisions are tough, materials can vary from low end to high end, and budgets are hard to meet. There are also utilities in kitchens that have to be worked with including gas and electric. When completed kitchen remodel sets the entire tone and feel of the home. Often serving as an entertaining room for guests, the kitchen can be a place that you really show off your style and design. Bathroom remodels can be an easier process than a kitchen remodel. Bathrooms are usually a smaller space and other than flooring and fixtures, the decisions are minimal. Bathroom remodels can usually use the exisitng plumbing and electrical that is already installed.